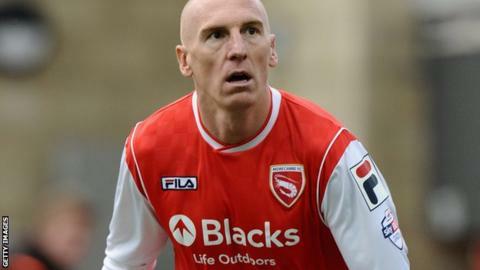 Morecambe winger Kevin Ellison will be out for at least a month after suffering a fractured eye socket when scoring a late winner at Mansfield. Ellison, 34, was kicked in the face as he headed in at Field Mill. "Big Kev has put his head in where not many others would and that is what he is all about," manager Jim Bentley told BBC Radio Lancashire. Morecambe came from a goal behind to win 2-1 and end a run of four games without a victory. Jack Redshaw levelled from close range before Ellison nodded home five minutes from time and Bentley feels Ellison repaid the faith shown in him. "I have kept by him and he has come up trumps but it has come at a cost," Bentley continued. Morecambe will miss the goalscoring exploits of Kevin Ellison having scored six goals so far this season. He managed 13 last season and 17 in 2011/12. "I know exactly how he trains, what sort of person he is and what type of professional he is. You know what you are going to get from him. He will score out of nothing." Morecambe lie in 10th position in League Two, just three points off a play-off spot, but have won just twice in the last eight games. Bentley is pleased with the commitment of his side and says any criticism they have received has been "undeserved". He added: "I have to pick the team, I am paid to do that job. Afterwards, people say 'he's like Mourinho because he got it right'. "We have a small squad, we are not one of the fancied boys but I know we have an unbelievable desire. "They keep going, they take the setbacks when we are on a sticky run and get the pats on the back when they are doing well."